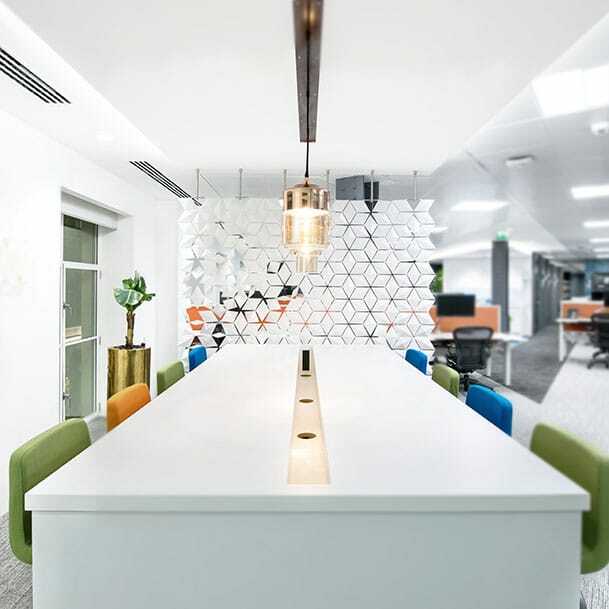 Create a space that is modern, functional and inspiring to your employees. We have the exact office room divider that you have been looking for. Facet, our designer room divider, is an eye-catching piece that will make your office space a joy for everyone to work in. Not only is our office room divider a stunning thing to look at, it is also very practical. It can be hung from any type of ceiling meaning you can place it anywhere in your office space. It can also be made in any size that you need and for high or slanted ceiling we offer different options to attach Facet to your office ceiling. Choose a matching color from our selection of colors or, if you have a specific RAL color in mind, we can create if for you. Facet consists of several diamond-shaped parts that are connected with a smart design. The smart design enables you to turn the facets around. This gives you the possibility to create more or less privacy depending on your needs. 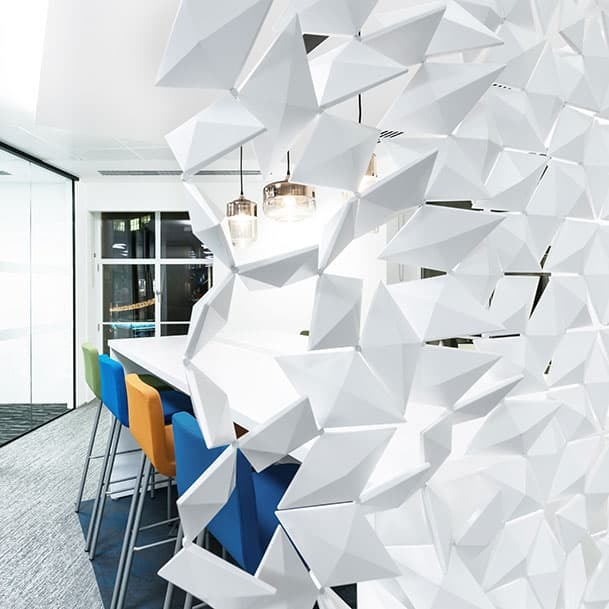 A unique, versatile office room divider. 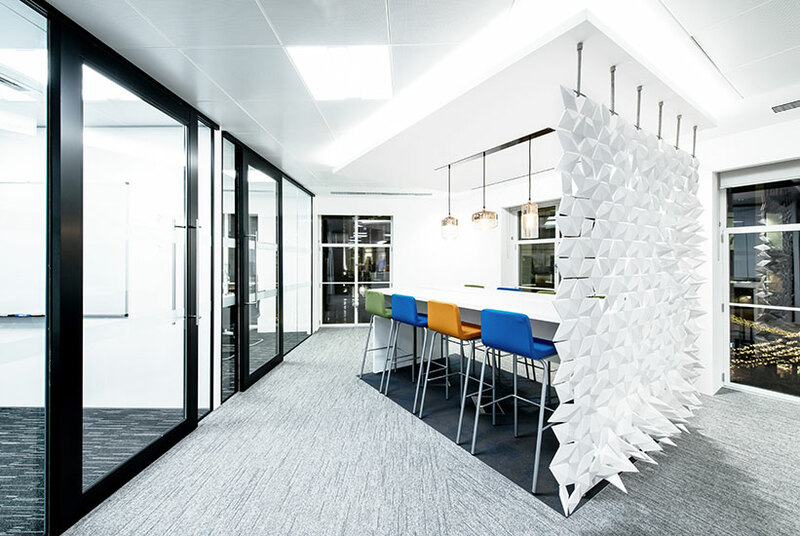 The beautiful and bright office room divider featured in this piece is in the office of Global Technology Company in London, the UK. It complements the crisp and light feeling of the office interior while providing privacy when needed. The versatility of Facet is clearly portrayed in these pictures. In some pictures, the diamond-shaped facets are neatly closed to show off the perfect geometric pattern while providing maximum privacy. In other pictures, the facets are turned to create a more see-through room divider that has a more edgy look. Vielen Dank für Ihr Interesse an Bloomming. Bloomming kreiert faszinierende Raumgestaltungsprodukte – Designprodukte für Sie. Uns macht es Freude, flexible, modulare Lösungen für Wohnungen, Büros, Ausstellungen, Events und öffentliche Räume zu entwickeln. Wir sind Mireille Meijs und Bas van Leeuwen. Gemeinsam mit allen anderen des Bloomming-Teams ist es unser Ziel, die Welt ein bisschen schöner zu machen. We are highly satisfied with the room divider Facet: it is a beautiful product, which is easy to install and absolutely very original. The packing for shipment is very suitable for long distance transport (we had the room divider shipped to Argentina). The service we received, before and after purchase of he divider, was indeed excellent! We strongly recommend the room divider Facet and Bloomming as a company. Sunlight entering a room can be breathtaking, but sometimes so bright you'll have to close your curtains or blinds. These type of static sun blocking systems will make a room or space very dark. To locally create light and shadow, you can turn the diamond shapes of the room divider facet individually. You can create parts which are (partially) opened or closed. By creating a pattern that looks like frost flowers on your window you can play with the sunlight. Bleiben Sie auf dem Laufenden über die neuesten Bloomming -Designprodukte, Anwendungsbeispiele und Neuentwicklungen auf dem Gebiet der Raumgliederung. Profitieren Sie von exklusiven Angeboten. Und abmelden ist natürlich jederzeit möglich. © 2019 Bloomming. Allgemeine Geschäftsbedingungen. Datenschutzerklärung. Innerhalb der EU verstehen sich die Preise zuzüglich 21% Mehrwertsteuer.